To Øl | Beer Apprentice - Craft Beer News, Reviews, Interviews and Info. How’s it going guys? For today’s craft beer review I’m going to be trying the To Øl Mochaccino Messiah produced by the To Øl Brewery located in Frederiksberg C, Denmark. I’ve enjoyed what few beers I’ve had from To Øl and it’s been a while since I’ve had a brew from them, so I’m pretty excited about giving this one a test drive. I checked on the website, to-ol.dk, and found this bit of info. Sounds good. Let’s give it a try. This beer came in a 25.4 oz bottle and it had an ABV of 7.0%. It poured a deep, dark brown color with some ruby red highlights showing around the edges when held toward the light source. The head was light tan, huge, soapy and soft. A lot of large bubbles formed too. The retention time was ok and a ton of patchy lacing was left behind once it began to settle. The aroma released a nice shot of coffee bean to begin with. A sturdy amount of piney and earthy hops were discovered as well. Those wafts were followed by an almondy hint that was accompanied by an undertone of a light tobacco leaf. Hmm. Very nice, but….. interesting. The flavor discharged more of the expected roasted coffee tones of course, yet it also touched on some slightly toasted dark breads and even a bit of bitter chocolate. The piney and earthy hops were accounted for again and as it began to warm the earthiness really started to stand out and become more dominant. The mouthfeel was medium bodied. Smooth, dry and just a touch chalky. The carbonation seemed about right and a good amount of flavor was left behind on the palate between sips. Overall, I felt that this was a decent beer. Those that know me realize that I love Coffee Stouts, however I felt that this one fell just a bit short of some of my favorites. It was good, but the earthiness was a lot stronger than I’m accustomed to with the style. Oh well, I’d still recommend trying it because it’s a well made and worthy drink for sure. The drinkability was pretty good and it would definitely hit the spot during the cooler months of the year. 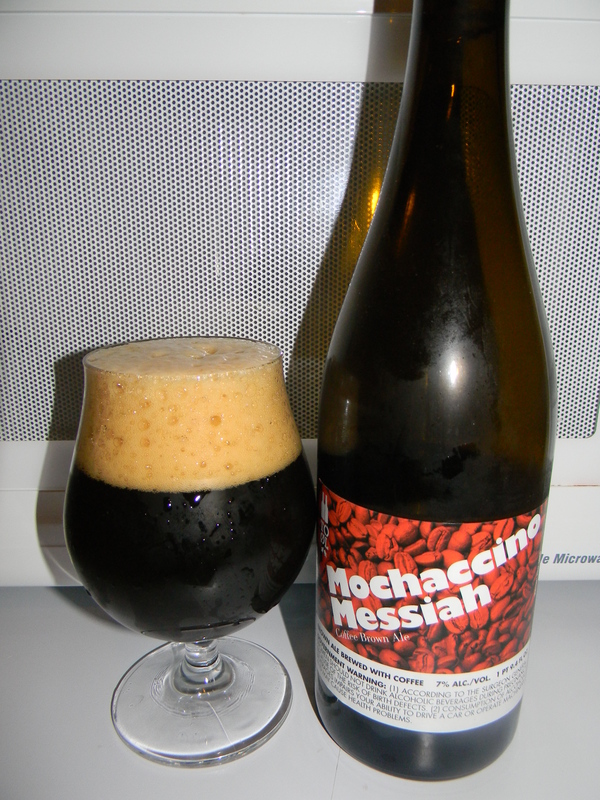 Have you guys ever had the To Øl Mochaccino Messiah? What was your opinion? Feel free to leave a comment and tell me all about it. Hello everyone. For today’s craft beer review I’m going to be tasting the To Øl Goliat Imperial Stout brewed by the To Øl Brewery located in Frederiksberg C, Denmark. I’ve only had a few brews by To Øl, however I’ve enjoyed them very much. They are a bit tough to get around here, so I try to pick them up every time I see them. The website, to-ol.dk, brought this bit of information to light about this brew. This brew came in a 12.7 oz. bottle and it had an ABV of 10.1%. It poured pitch black with a dark tan, mocha colored head. It was sized excellently. It was fluffy with some smoothness and a few larger bubbles at the spot of the pour. It looked like the top of a chocolate milkshake. The retention time was outstanding and the lacing was wonderfully foamy and sticky. Just an all around gorgeous looking beer. The nose was outstanding. It had hints of roasted coffee and light espresso. A slight bittersweet, dark chocolate along with some earthy hop tones and a very light hint of anise. It even smelled “fresh”. Not stale or dull in anyway. Very nice. The flavor produced some roasted coffee beans as well as some dry cocoa powder savors. Maybe even a little relish of char. Again, it had some earthy hop type tones that commingled so well with that alluring bitterness from the coffee and chocolate. Only a meager amount of alcohol was ascertained and the anise that was found in the aroma was dialed back even more in the taste. The mouthfeel was medium to full bodied. It was smooth, chewy, chalky, slick and very dry. The carbonation was on the lower side and a negligible amount of warmth was felt at the back of the throat and on into the belly. A very sturdy dose of flavor was left behind on the palate after each sip. Man, this was a great beer and I thoroughly enjoyed it. It’s easily worth a try if you can obtain a bottle. Even though the drinkability was quite good for a beer with an ABV of 10.1%, I do think that it would be best reserved as a Winter sipper. Either way, I don’t think that I would turn this down regardless of the season. As I’ve mentioned a time or two before, I love Coffee Stouts and this one did not disappoint. I’m going to have to bookmark it in my mind for the next time I go shopping. 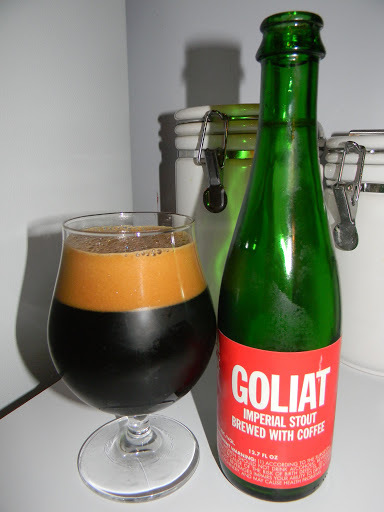 Have you guys ever tried the To Øl Goliat Imperial Stout? What did you all think about it? Feel free to leave a comment if you wish. I really enjoy interacting with all of you. Hi guys. For today’s craft beer review I’m going to be trying the To Øl Final Frontier produced by the To Øl Brewery located in Frederiksberg C, Denmark. This will be my first review of anything from these guys, so let’s get to the website, to-ol.dk, for some information regarding this beer. This is it! The sequel to the hop success of First Frontier. This beer is the final in every way. We recommend it as the final of your evening! This is an extremely potent and yet well balanced Double India Pale Ale. This beer is well suited in extreme environments, whether it be Siberian winter, Volcano eruptions on Java, Danish earthquakes (They exist!) or rush hour. This beer is seeking out frontiers and built for the test. This brew came in an 11.2 oz. bottle and it had an ABV of 9.0%. It poured a hazy, caramel brown to orange color. The crown was off white, soft, soapy and rocky. It was sized wonderfully and it provided and excellent retention time. The lacing looked pretty darn good too. Tons of foam and bubbles were left sticking to the side of the glass. The nose brought forth some fresh and juicy hints of pineapple, grapefruit and orange. A very light aroma of pine and resin as well as a solid bit of caramel sweetness underneath. Just a smidgen of alcohol was detected deep within. A very nice and well balanced bouquet in my opinion. The taste seemed to release more of the caramel malt than was found on the nose. A lot more dank resin too. The bitter hops were still present and quite a bit of the fruity grapefruit, pineapple and orange citrus were recounted also. Just a touch of a biscuity/grain flavor blended in very nicely while a slight redolence of booze made itself known at the back end. The mouthfeel was a sturdy medium. Very smooth, chewy, sticky and dry. A light feeling of warmth was felt from the alcohol and a good, medium strength carbonation made for an easy swallow. An excellent amount of flavor was left behind after each sip too. Man, this was a great little beer. Definitely a sleeper in my opinion. I wish I would have picked up another bottle. 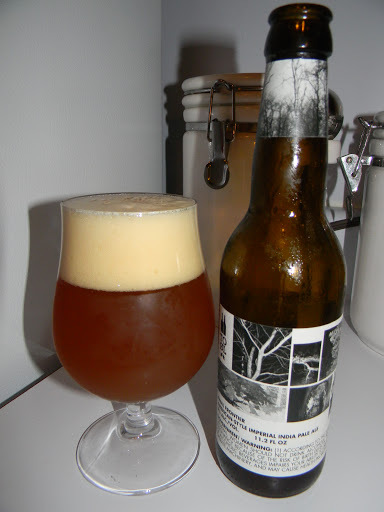 It had enough character to satisfy most any craft beer drinker and it is easy enough to drink that it would be a great introductory beer for someone looking to try a DIPA if they have yet to do so. I believe that the To Øl Final Frontier could be enjoyed at anytime of the year as well. With that bit of warmth it would even be satisfactory during the cooler months. So, if you guys happen to see this bottle relaxing on the shelf and being overlooked by most everyone in the store, pick it up and give it a test drive. I really doubt that you will be disappointed.